The Premier League returns after the international break with some intriguing games to look forward to. We still have three sides with 100% records as we enter the fifth round of fixtures and it will be fascinating to see how many come out of this weekend with those records still intact. Our football expert has cast an eye over the best of the action and gives you his best Premier League bets. The opening fixture of the weekend and the most appetising on paper as two of last season’s top-four face off at Wembley. Jurgen Klopp’s side have started the season in impressive fashion, winning all of their first four games and if it hadn’t been for an Alisson mistake against Leicester, it would have been with four clean sheets. Their summer acquisitions seem to be merging well with the talent Klopp already had at his disposal and when you have the likes of Sadio Mane, Roberto Firmino and Mo Salah up front, you’re going to be a handful for anyone. Their hosts went into the international break on the back off a disappointing away defeat to Watford, where sloppy errors at set pieces cost them dearly. Prior to that loss, Mauricio Pochettino’s side had won their first three league matches, including an impressive 3-0 away win against Manchester United at Old Trafford. Four of the last five games between these two have seen both sides get on the scoresheet, with three of those producing three or more goals. So, in short, with so much attacking quality on display, this one has got to have goals. 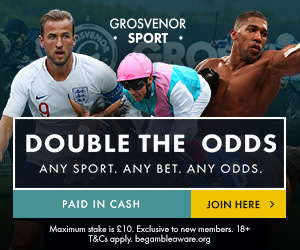 While both teams to score looks nailed on at 1/2 with Grosvenorsport.com, I wouldn’t put anyone off backing over 3.5 goals at 13/8. Perhaps surprisingly, Manchester City don’t sit top of the Premier League after four rounds of fixtures. Their away draw to Wolves means they sit fourth with 10 points and Pep Guardiola will want improvement from his side after they rather scraped over the line against Newcastle in their most recent outing. They take on a Fulham side who seem to be beginning to get their act together on their return to the Premier League after defeats in their opening two matches. Their improvement has been largely due to the form of Aleksandar Mitrović who tops the goal scoring charts with four goals in his last three. On paper this looks a real up-hill struggle for the Cottagers and the recent meetings between the two sides don’t read well for them either. City have won the last five by an aggregate of 13 goals and I can only see the Citizens enjoying another comfortable afternoon on Saturday. City -2 at 4/5 looks well worth supporting, while the 9/4 about Sergio Aguero grabbing the first goal also looks worth a punt too. The Argentinian forward has four goals in four against Slaviša Jokanović’s side. Watford put their 100% start to the Premier League season on the line against Manchester United knowing another win will maintain their best ever start in the league. Javi Gracia has got his side playing an entertaining style of football with Troy Deeney and Andre Gray offering plenty of fire power up top. They outmuscled Spurs in their last game with two set piece goals proving decisive and the Hornets will come into this one brimming with confidence. It’s hard to figure out the state in which Manchester United are currently in 10th in the league after seeing off Burnley in a potentially tricky fixture last time out, but prior to that they suffered back-to-back defeats against Brighton and Spurs. Such defeats cast doubt over Jose Mourinho’s future at Old Trafford and he’ll be seeking another away win to ease those fears further. The fact that United have conceded seven goals so far will really hurt Mourinho, who builds his success on a stingy defence who keep clean sheets in their sleep. The clean sheet against Burnley will have given his defence plenty of confidence and I don’t see Mourinho allowing Watford the same luxuries Brighton and Spurs received. United should edge it at 10/11, while under 2.5 goals at 5/6 looks another solid bet.